Happy new year! What would you like to see happen in Charlton over the coming 12 months. Here’s a few ideas from myself – obviously they reflect my own views and prejudices, which you may well know too much about anyway, so I’m more interested in what you’d like to see in SE7 in 2011. 2. Cleaner, safer streets. This has been a bugbear of mine for years, and it certainly drove the now-departed Charlton Average to distraction. But the lack of care and effort taken in looking after the streets, particularly around Charlton Church Lane and the streets leading off it, continues despite years of complaints to Greenwich Council. Whether it’s wheelie bins left blocking narrow pavements, or weeks-old rubbish left blowing around in the wind, parts of Charlton don’t receive the attention other parts of the borough get. Clearly the lazy low-lives that can’t be arsed to clean up after themselves share the blame – but a dirty environment will only get dirtier… and more dangerous. Hopefully 2011 will be the year this cycle is broken – but how? 3. Can we save the animal centre at Maryon Wilson Park? December’s news that the mini-zoo was under threat touched a chord that I expect surprised Greenwich Council, which aims to save £43,000 by trying to find sponsorship for it. If our local councillors really care for the area, now’s the time they should step forward and demand the council keeps this much-loved facility going. 4. A supermarket on Charlton Church Lane. This looks like it might well happen – it’s rumoured Sainsburys is to open a store beneath the housing now being built on the corner of Charlton Church Lane and Floyd Road. The supermarket giant has told The Charlton Champion it’s interested in the site, but hasn’t secured a deal. A store here would provide competition for the knot of newsagents and off-licences by Charlton station, as well as the Co-Op in The Village. Would a supermarket be welcome – or would it chase away much-appreciated small businesses? Any other thoughts, or any observations on the above? Let us know. If you’d like to turn any ideas into a full story for the Champion – you’d be more than welcome. 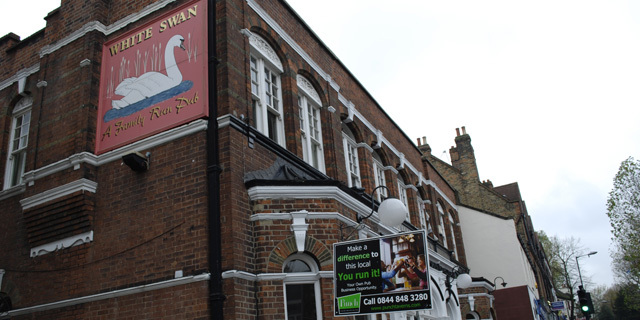 With regard to the Swan I had heard two guys had taken over and were giving out banning orders left right and centre. This was about 2 months ago but we havent been inside. Still have the usual suspects hanging about. Not sure how long these guys will last or have lasted? When we return to pubs, we can write about the Anchor… my head was sore Christmas morn but I think the little session was worth it! I think the supermarket would be very convenient for us lazy commuters to get straight off the train to be able to buy some fresh food without having to traipse too far. Though it would most likely wreck the trade for the local shops so would be of some concern. I know i would use it. What happened to the M&S food store at the petrol station on the lower road? Not get used enough? I would rather we didn’t have a Sainsbury local on the corner. As said above (sorry can’t see your full nick) it would probably wreck the trade for the local shops. I’m amazed that they there are so many similar places there anyway. You can buy fags, milk bread etc in five places (including the Post Office) in an area of 100 yards! Bread and milk are very cheap in the parade (in the shop I use milk is 1.10 a litre and Kingsmill is 95p – both cheaper than supermarkets). Also, ‘locals’ are not necessarily keenly priced at all, they’re certainly dearer than supermarkets themselves. The way these chains often work is to undercut the competition until it’s gone and then start raising prices. On another point, the area around the station is chipless at night for the time-being. The chip shop up Charlton Church Lane seems to have been more badly damaged than at first thought and yesterday (Jan 3) was being fitted out in a major way and the Charlton Kebab Emporium is also being gutted and will open on Jan 10 according to a sign amidst the rubble. A mini-Sainsbury’s would be a major boost. The local shops are ok but they are hardly dynamic or inspiring and nothing like the gems in Royal Hill. Sainsbury’s would offer a better range and better quality than on offer today and their presence could attract bigger and better brand names. Who knows, we might even get a coffee shop! Agree with the rest of your selection Darryl – it will be a crime if the animal park in Maryon Wilson were to close. One less dismal pub on the Lower Road would be most welcome too! The Rose of Denmark apart, The Pickwick, The Angerstein, The Lib, The Con and The White Horse could all do with major investment. If one of them did it, they could clean up and might encourage more locals to go for a pint. Can anyone say when the watch repairer closed down in the Village? And who used to live at number 61 now long gone.Me an my family used to live at 2 prince henry rd for 30 years. I have some photos to share if interested of the 60s/70s.